Sew what's cooking with Joan! : Bigos - Hunter's Stew in a Slow Cooker! 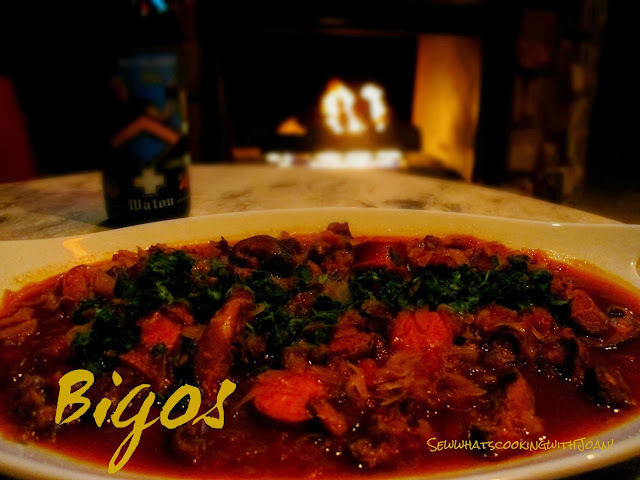 Bigos known as a hunter's stew, is a traditional meat stew, typical of Polish, Lithuanian, Belorussians and Ukrainian cuisine, and is the Polish National dish. I learned to make this in my cooking classes with Eva Kenly in February of 1994. I was taken by this dish the moment I tried it, and wrote on the recipe, "Excellent, must do", I have made this many times since. There is no single recipe for a savory stew of cabbage and meat, as recipes vary from region to region and from family to family. Typical ingredients include white cabbage, sauerkraut, various cuts of meat and sausages, often whole or pureed tomatoes, honey and mushrooms. The meats may include pork(often smoked), ham, bacon, sausage, veal, beef, and, as bigos is considered a hunter's stew, venison, rabbit, or other game; leftover cuts find their way into the pot as well. It may be seasoned with pepper, caraway, juniper berries, bay leaf, marjorum, pimento, dried or smoked plums, and other ingredients. Bigos is usually served with mashed potatoes or rye bread. As with many stews, bigos can be kept in a cool place or refrigerated and then reheated later; it is said that its flavour actually intensifies when reheated. One observed tradition is to keep a pot of bigos going for a week or more, replenishing ingredients as necessary.....this is called a perpetual stew. 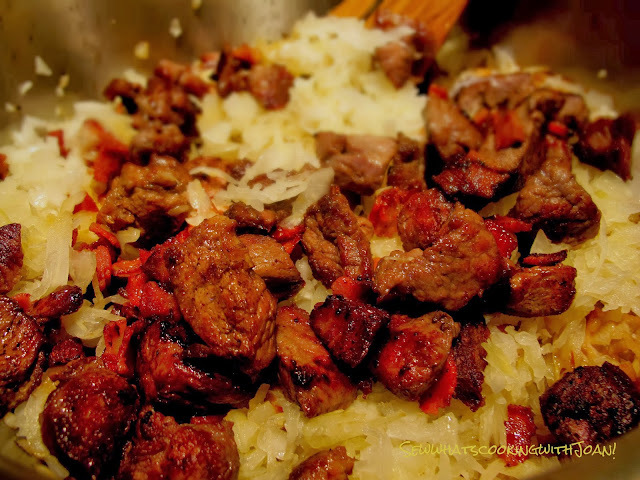 This, the seasonal availability of cabbage, and its richness in vitamin C made bigos a traditional part of the winter diet in Poland and elsewhere. It is a popular dish in Poland to be served on the Second Day of Christmas. Place mushrooms in a bowl. Bring beef stock to a boil and pour over mushrooms, set aside for 1 hour. 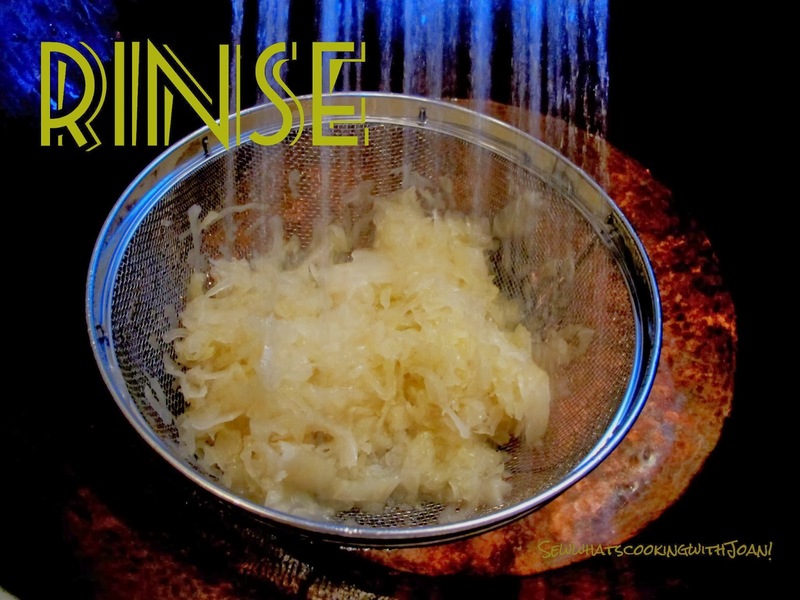 Drain mushrooms through a coffee filter, reserving the beef stock. Slice the mushrooms. In a large, heavy saucepan, cook the bacon until crisp. Remove with a slotted spoon, to the paper towels. Reserve bacon. In the same sauce pan, either using bacon fat or oil, brown the beef, lamb and pork. So not crowd the pan, rather brown in batches. When all the meat is browned, return to saucepan. Add cooked bacon, sauerkraut, onion, apple, cabbage and diced tomatoes. cook over low heat, for 20 minutes, stirring frequently. Add mushrooms, beef stock and wine to the pan. Season with salt and pepper, and bring to a simmer. Cook, covered, for 1 to 1 1/4 hours, or until tender. Add the kielbasa and cook for another 20 minutes. Or, in my case, I transferred to the refrigerator over night, then, in the AM I put it in the slow cooker on high for 6 hours, turned to low and put the kielbasa in cooked for 1 1/2 hours at low, then turned the cooker down to "stay warm". Place bigos in serving bowl and garnish with parsley. Serve with mashed potatoes, boiled potatoes or rye bread. I served with a Southwestern salad (future blog), creamy mashed potatoes and crusty toasted rye bread. For dessert delicious "Caramel Custard"(future blog). Can be reheated or frozen. I had enough left over for two people, I put it in the freezer! 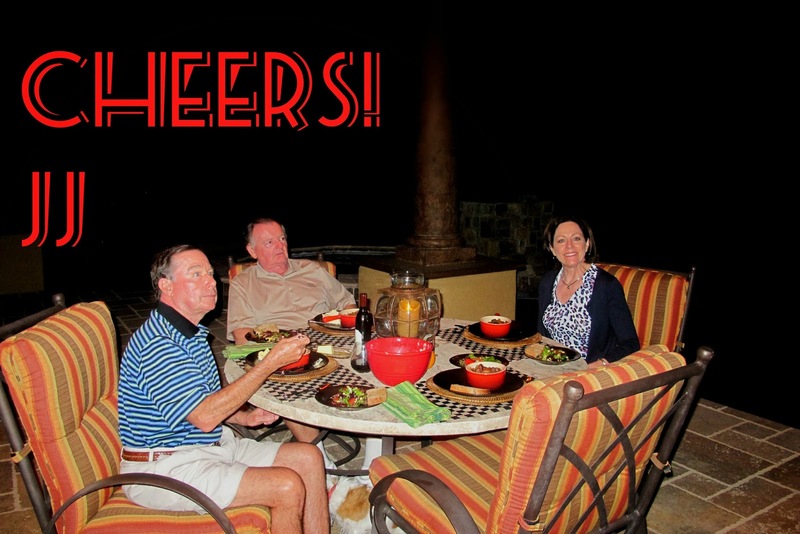 We had a lovely dinner with friends Jim and Ruth watching Monday night Seahawk's football on the patio! They both raved about the Bigos....it was a winning night all the way around!! Excited my son TT came for a visit for a couple days, then, he has business in Phoenix. We are having a great visit! Yippee! …Horay for this delish recipe! I can’t wait to try it myself. I stumbled upon your blog from a Pinterest posting, and I hope you don’t mind, but I am going to put a link to this recipe on my Thanksgiving page. Good Luck with all of your future recipes…I am excited to see what else you have up your sleeve! I made for my family last night, delicious! Perfect for the cold weather. I noticed I didn't sign above. I am Ann from Ontario.